The measure consists in cleaning lamps and luminaires every year with soft moist cotton cloth, soft-bristled anti-static brush, or low-power vacuum cleaner as well as replacing bulb lamp at the end of its lifespan or lenses if they appear yellow. Initial investment: low. 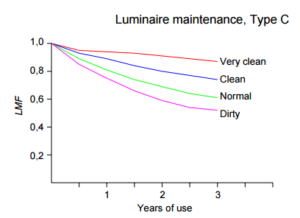 The total cost depends on the quantity of luminaires and lamps which must be cleaned and the quantity of bulb lamps which need to be replaced. It reduces costs associated to lighting energy.